Researchers at MIT and Brigham and Women’s Hospital have built a flexible sensor that can be rolled up and swallowed. Upon ingestion, the sensor adheres to the stomach wall or intestinal lining, where it can measure the rhythmic contractions of the digestive tract. Such sensors could help doctors to diagnose gastrointestinal disorders that slow down the passage of food through the digestive tract. They could also be used to detect food pressing on the stomach, helping doctors to monitor food intake by patients being treated for obesity. The flexible devices are based on piezoelectric materials, which generate a current and voltage when they are mechanically deformed. They also incorporate polymers with elasticity similar to that of human skin, so that they can conform to the skin and stretch when the skin stretches. In a study appearing in the Oct. 10 issue of Nature Biomedical Engineering, the researchers demonstrated that the sensor remains active in the stomachs of pigs for up to two days. The flexibility of the device could offer improved safety over more rigid ingestible devices, the researchers say. “Having flexibility has the potential to impart significantly improved safety, simply because it makes it easier to transit through the GI tract,” says Giovanni Traverso, a research affiliate at MIT’s Koch Institute for Integrative Cancer Research, a gastroenterologist and biomedical engineer at Brigham and Women’s Hospital, and one of the senior authors of the paper. Canan Dagdeviren, an assistant professor in MIT’s Media Lab and the director of the Conformable Decoders research group, is the paper’s lead author and one of the corresponding authors. Robert Langer, the David H. Koch Institute Professor and a member of the Koch Institute, is also an author of the paper. Traverso and colleagues have previously developed ingestible devices that can be used to monitor vital signs or deliver drugs to the digestive tract. With the goal of developing a more flexible sensor that might offer improved safety, Traverso teamed up with Dagdeviren, who previously developed flexible electronic devices such as a wearable blood pressure sensor and flexible mechanical energy harvesters. To make the new sensor, Dagdeviren first fabricates electronic circuits on a silicon wafer. 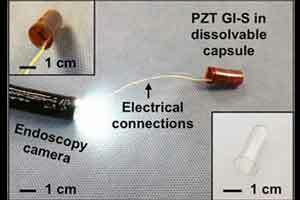 The circuits contain two electrodes: a gold electrode placed atop a piezolelectric material called PZT, and a platinum electrode on the underside of the PZT. Once the circuit is fabricated, it can be removed from the silicon wafer and printed onto a flexible polymer called polyimide. The ingestible sensor that the researchers designed for this study is 2 by 2.5 centimeters and can be rolled up and placed in a capsule that dissolves after being swallowed. In tests in pigs, the sensors successfully adhered to the stomach lining after being delivered endoscopically. Through external cables, the sensors transmitted information about how much voltage the piezoelectrical sensor generated, from which the researchers could calculate how much the stomach wall was moving, as well as distinguish when food or liquid were ingested. “For the first time, we showed that a flexible, piezoelectric device can stay in the stomach up to two days without any electrical or mechanical degradation,” Dagdeviren says. This type of sensor could make it easier to diagnose digestive disorders that impair motility of the digestive tract, which can result in difficulty swallowing, nausea, gas, or constipation. Doctors could also use it to help measure the food intake of patients being treated for obesity. “Having a window into what an individual is actually ingesting at home is helpful, because sometimes it’s difficult for patients to really benchmark themselves and know how much is being consumed,” Traverso says. In future versions of the device, the researchers plan to harvest some of the energy generated by the piezoelectric material to power other features, including additional sensors and wireless transmitters. Such devices would not require a battery, further improving their potential safety.